The vast wild places of Southwest Montana are home to incredible biological diversity, from tiny shrews to massive elk and other iconic creatures of the West, like grizzly bears and gray wolves. Bring good binoculars or a spotting scope as well as some patience. 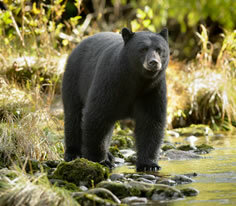 Black bears can be found throughout most of North America, including Montana, and are smaller than grizzly bears. Grown males weigh between 180 and 250 pounds. Black bears, despite what their name suggests, can also be brown, white, chestnut or blonde. While they’re at the top of the food chain, black bears are not known to hunt for meat. They subsist more on berries and plants, and sometimes fish and grubs. They are opportunist feeders and are infamous for stealing food left unattended. In the lower 48 states, grizzly bears are unique to Montana, Idaho, Wyoming and a small part of Washington. Grizzlies are much larger than black bears, and grown males weigh an average of 440 pounds. Grizzly bears are solitary animals, with the exception of young cubs and mothers. 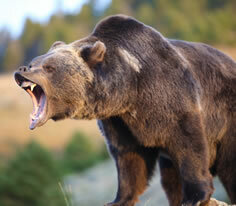 The grizzly bear, along with the wolf and mountain lion, is a top predator species in Montana. They hunt elk and deer, and can be found near waterways. When they feel threatened, they can become aggressive toward humans. Though this is rare behavior, and it is suggested that—as a precaution—humans carry bear spray while hiking anywhere in grizzly country. The elk is an iconic representation of the American West. 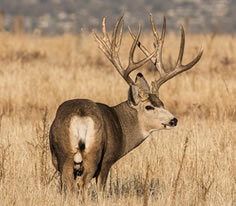 Adult males have large antlers and can weigh between 500 and 600 pounds. Elk are migrators, summering at higher elevations and wintering in lower elevations. 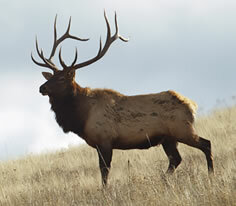 Elk are a draw for hunters and wildlife viewers alike. Moose are prevalent in Canada, and in the western United States they can be found in a small territory that includes Montana. These ungulates are usually solitary, and males can weigh up to 1,200 pounds. 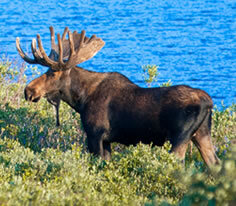 Moose tend to favor wet groves of willow or similar species. 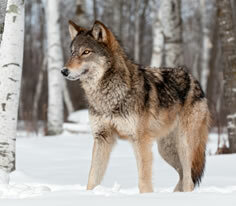 Despite their name, gray wolves are either brown or black, and adult males weigh around 100 pounds. Wolves historically ranged throughout most of North America and into Central America, but can now only be found in small patches near the Canadian border states, including western Montana. Wolves are pack animals and usually travel in large family groups. 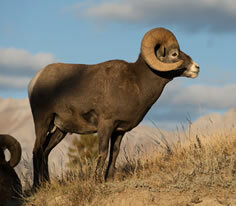 Bighorn sheep have a small range in North America, including most of western Montana. They can be spotted on the sides of cliffs and rocks, with their hooves designed to traverse steep, rocky terrain. Adult males may reach around 300 pounds. The majestic mountain goat has a fully white coat year-round. Their hooves are designed to withstand rocky, steep conditions, and older males can weigh up to 300 pounds. 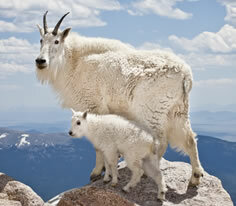 In the lower 48 states, mountain goats are only found in small patches throughout Montana, Idaho, Wyoming and Washington. 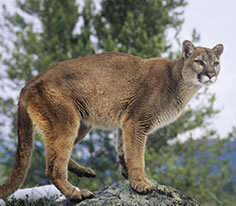 Mountain lions range from Alaska to South America, but in the United States are most prevalent in the West. Mountain lions are hard to spot and spend their time in trees hunting deer and elk. These solitary cats can weigh between 150 and 190 pounds, and they usually hunt at dusk, dawn and nighttime. 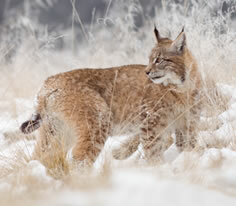 Bobcats are found throughout North America and can vary in color from spotted to solid grays, browns and reds. They are roughly double the size of domestic house cats, with grown males weighing up to 35 pounds. These small predators tend to spend time in grassy areas and shrublands. The American bison, also called the buffalo, is the national mammal of the United States. This massive animal can weight up to 1,400 pounds. Bison can be seen on ranches throughout the Bitterroot Valley and Southwest Montana, and bison herds can be seen in nearby Yellowstone National Park. 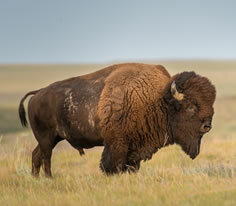 Bison primarily eat grasses and are culturally significant to American Indian tribes in the area. The skunk is a creature specific to North America and is about the size of an average house cat, with adult males weighing up to 14 pounds. 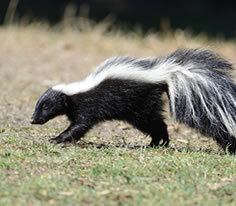 Skunks emit a strong odor as a defense mechanism against predators, and they are mostly nocturnal. 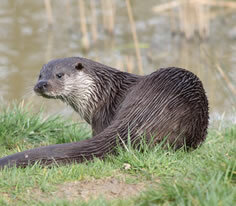 River otters are semiaquatic mammals that feed on freshwater river fish. An adult male otter weighs about 20 pounds. Otters have webbed feet and thick fur to withstand cold river conditions, especially in Montana. This small dog-like creature can be found in Montana as well as throughout Canada and into the eastern United States. Adult males weigh up to 15 pounds. 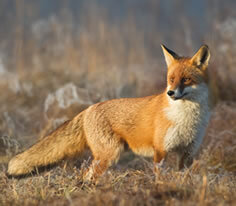 Foxes are most commonly found in forested areas. Known as “muleys” to the locals, mule deer are one of the two most common deer species in Montana and the western United States. They are migratory animals, and adult males can weigh between 250 and 275 pounds. The white-tailed deer is the most common deer species in the United States and is one of the two most common deer species in Montana. 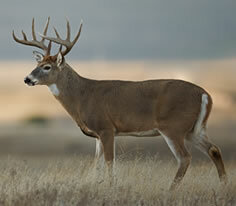 White-tailed deer males weigh between 250 and 275 pounds. 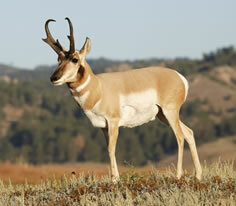 The pronghorn is a species common to the western United States. Pronghorn males are solitary animals, though in the winter they may be seen with herds. Pronghorns can run up to 55 mph, and adult males can weigh up to 125 pounds. 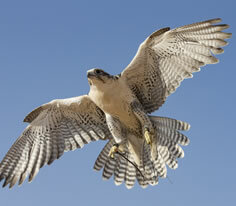 This falcon has an average wingspan of 35 to 44 inches and can be found across the western regions of the Americas. They usually nest high on vertical cliffs to protect their young from predators and, for hunting purposes, are most commonly located near water. The bald eagle is the national bird of the United States, and it can be seen flying around the lakes and mountains of Southwest Montana. 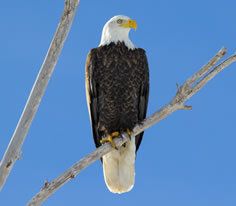 Bald eagles have a wingspan between 66 and 90 inches. 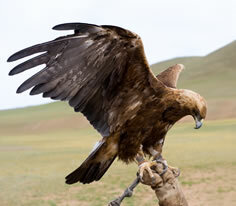 The golden eagle can be found throughout North America, from Canada down into Central America. They are golden-brown in color and have a wingspan between 80 and 94 inches.